This article was originally published on YogaCityNYC.com. Thanksgiving is a time of thanks and, of course, food. Why not do something different this year? Offer your guests these delicious, healthy, organic, vegan dishes that will knock their socks off and save a few turkeys. In the aftermath of Hurricane Sandy, it is especially important to remember what this holiday is really all about. And here is a novel way to get everyone in a thankful mood. After all of the guests have arrived and it is time to sit down to dinner, offer them a piece of paper and a pen. (It’s really festive if you have lots colorful construction paper, like the kind kids get in school.) Then ask everyone to write down what he or she is thankful for and they can either sign it or keep it anonymous. Place a big clear vase, jug, or jar in the middle of the table and have each guest fold his or her paper and drop it in. At the end of the meal, just before the dessert is served, ask each guest to pick one out and read it aloud, spending a few moments being thankful. Now it’s time to eat. And, let’s face it, the sides are always the best part of the meal – especially a vegan one. Here is my Thanksgiving menu for you. Enjoy! Cut the vegetables. Mix the ingredients for the dressing together. Serve! * Be sure to look for vegan or “suitable for vegans” on the label of the sugar you purchase as some sugar is processed with the bone char of animals. Sift the flour into a big mixing bowl. Add the baking powder, salt, and sugar. Mix the flax egg and let it set for a few minutes to congeal. In the meantime, cut the corn off the cob. Add the corn, flax egg, and water to the mixture. The batter should be easy to mix, not to dough-y or runny. Add the extra water if necessary. Heat up a skillet with sunflower oil. Using a 1/4 cup measure (this makes about 9 nice sized fritters), pour the fritters in and let them fry up. Yes, we are frying here! Be careful and don’t let the oil get too too hot because the corn can start to pop and fly out of the skillet! When there are little bubbles on the top side, flip them over (kind of like pancakes) and let the other side brown. Drain on paper towels before serving. Chop up the cauliflower. Peel, deseed and chop the squash. Cut the onion into chunks and smash the garlic. Toss everything with olive oil and salt and pepper and roast on a big baking sheet for 40 to 45 minutes until everything is soft. Turn the entire mixture into a big soup pot and add vegetable stock. Chop the sage and add to the pot. Bring to a boil and then simmer for 15 minutes. Using an immersion blender, puree soup until is completely smooth. 1/4 cup chopped mintMake the quinoa. In a mixing bowl, toss warm quinoa with lemon juice, olive oil, and salt and let sit until it reaches room temperature.Dice the cucumbers and celery, slice the scallions, and chop the parsley and mint. Combine quinoa with the rest of the ingredients. Adjust seasonings. Enjoy! Chop up the walnuts and place them on a baking sheet. Toast for 5 minutes in a 350 oven. Slice the onions into semicircles and sauté in olive oil, with a dash of salt and pepper. Quarter the Brussels sprouts and when the onions are translucent add the Brussels sprouts. Season with salt and pepper. Add the cranberries and walnuts. Brussels sprouts should be bright green! Bake the potatoes. When they are done, peel and place in a mixing bowl. Add the pineapple and orange juice. Mix well. Pour sweet potatoes into a pie dish and bake in a 350 oven for 20 minutes. Top with marshmallows and bake for 10 more minutes so the marshmallows get brown. Preheat the oven to 350. Whisk the flax eggs and set aside. Line a baking sheet with parchment paper.Sift the flour into a big mixing bowl and add in the rest of the dry ingredients. Mix well, breaking up any lumps of brown sugar. Add the oil and flax eggs. Mix with a wooden spoon to combine into dough.Using the ice cream scooper, scoop the dough onto the parchment paper leaving some space because they spread. Pat them down lightly with the wooden spoon the top is more flat than round. Bake for 20 minutes. This delicious spread will tantalize taste buds and fill bellies. 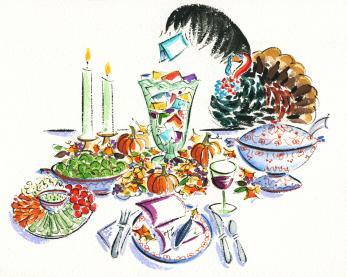 There is no need for a “main dish” as you and your guests will enjoy colorful plates full of nutritious, healthy food. And, it is much easier to be thankful when no animals were killed in the making of the Thanksgiving meal.